French sociology was institutionalized as a university discipline at the turn of the 20th century by a group of republican non-conformists. It has striven to maintain autonomy by implementing peer-based scholarly standards and collegial self-government. Russian sociology was initially founded by political exiles in Paris; in the Soviet Union and post-Soviet Russia, the administration of the discipline has remained within the hands of a professional bureaucracy. In pre-revolutionary Russia, sociology was a leisure activity; in the Soviet Union, it was a branch of state service; in contemporary Russia, disciplinary power has been transferred from the state to academic administrators, reinforcing local hierarchies. These structural changes are reflected in research methods and career choices. Russian and (slightly abridged) English version. Bikbov, Alexander. 2009. “Is Sociology the Same Discipline in Russia and France? A Brief Political Micro-History”. 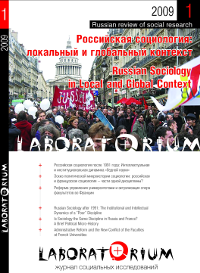 Laboratorium: Russian Review of Social Research 1 (1), 124-39. http://www.soclabo.org/index.php/laboratorium/article/view/127.